When The Hurt Locker first screened locally, I had little to no idea what it was about. It featured unfamiliar actors and a rather stark setting, but my lingering interests in the military and foreign operations in the Middle East. And my partner and I were pleasantly surprised by that movie and were certainly glad that we managed to catch it. so it became as little to know surprise when it became such a hit at the Oscars and we had already seen it. Insert feeling of smug hipster satisfaction here. Fast-forward to the present day and nearly everyone has director Kathryn Bigelow on their Oscar radars. And would you expect anything less given Bigelow has the distinction of being the first female director to win the Academy Award. Given this is her first movie since The Hurt Locker, expectations have been running a tad high. And again she showed no hesitation in tackling a rather famous and yet potentially controversial story with this film - one that is bound to polarize audiences and critics alike. 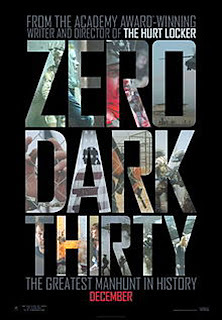 Synopsis: Zero Dark Thirty is a tagged as an action thriller, although don't know how accurate a genre classification that is. It was directed by Kathryn Bigelow with a screenplay by Mark Baol, who was also responsible for the screenplay of The Hurt Locker. In the movie we follow a CIA officer named Maya (Jessica Chastain) who has just been reassigned to Pakistan to contribute to operations hunting down leads to Osama bin Laden, known leader of the terrorist group al-Qaeda. Initially we watch her accompany another officer, Dan (Jason Clarke), as he routinely employs "enhanced interrogation techniques" in trying to extract information from detainees at secret CIA "black sites". This eventually leads to a potential lead that Maya strong believes in - this being the supposed courier for Osama bin Laden, one Abu Ahmed. She then focuses all her efforts on trying to locate this mysterious figure who has been named in several detainee interrogations and yet no physical evidence of his existence can be found. Meanwhile various terrorist attacks continue around the world and the CIA task force feels more and more pressure to bring this issue to a close. The movie sort of follows the same almost documentary-like feel that we experienced in The Hurt Locker, although the movie remains to be a fictional approximation of what took place in the hunt of bin Laden. Instead of your typical Hollywood sort of dressed up action movie that almost celebrates violence with the use of extensive special effects, Bigelow instead just presents us with the events as they were - no window dressing and no frills. Thus the torture scenes aren't exactly an endorsement of the methodology by Bigelow, at least in my opinion. Instead this is the movie being open about the fact that torture happened and whether or not it was helpful is beyond anyone's ability to determine at this point. We witness Maya herself at first appalled by the sight of Dan abusing a prisoner and later on she finds herself taking a more active role in similar interrogations. In the end, the keys to finding Osama are more related to a lot of hard work and patience as Maya sorts through both truth and lies amid various sources who may have been tortured, bribed or otherwise coerced to share information. Like in The Hurt Locker, we are presented with a very close view of Maya instead of periodically jumping to a macro-level perspective of things. This is a procedural movie that stays in the trenches with the rest of the CIA and we never have to deal with Hollywood-style moments in the Oval Office with someone trying to resemble the President of the United States. And this again helps drive the drama and the tension and keeps things focused. Some may find the pacing of the movie a tad slow given the hunt in itself took years in reality. It is a lesson in patience and perseverance for both Maya and the audience since we aren't given the usual things to keep us entertained like big explosions or protagonists engaged in pitched gun battles. Instead a lot of the action seems to happen off-camera and we spend a heck of a lot more time watching Maya looking at interview records, meeting new suspects around the world and generally looking more and more stressed. Even the "big finish" of the movie, this being the actual reenactment of the operation that took out Osama bin Laden, was done practically in silence. The soldiers were not perfect cyborg-like killing machines. Instead they were just guys who were trained to do a job pretty well and they manage this with quick kill shots, muted whispers and even not immediately moving out of the way when told to do so. The movie does not "celebrate" what may have contributed to the leads that eventually located bin Laden. It does not sensationalize the heroics of the team that killed Osama. Instead it just shows what this really was - a long protracted investigation that eventually proved to be an acceptable risk. And when they US took their chance, it paid off. Thus the killing of Osama is not the high point of the movie - it was the inevitable conclusion of the CIA's hard work over the years - work that involved torture, lots of paperwork and some hunches here and there. 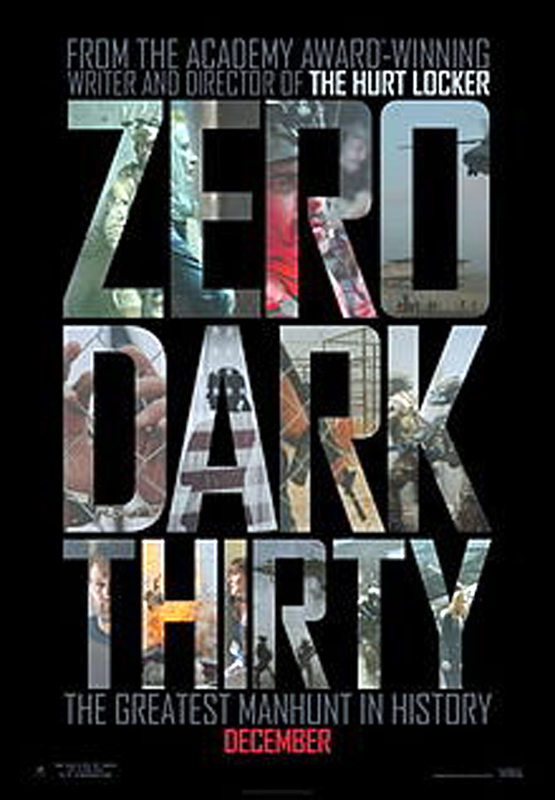 It is inevitable to compare Zero Dark Thirty to The Hurt Locker, where the latter may edge ahead given it had more of a "story" to follow. This movie dances on the fine line between fiction and documentary, thus leaving the viewer to decide for himself what the movie really wanted to say since it did not present a strong slant in things. I enjoyed it but I can understand why not everyone will and I understand that it's not the sort of movie that the Academy will readily reward a director for given the controversial tone. But I still give it 4 phantom leads that Maya chases down to no end out of a possible 5. It is a movie truly worth seeing.